Below are my personal new knights, I made these additions using Aly Fell's artwork I found on his website. I added these due to that I was very used to seeing the knights as males on horses, and I am used to the knights being described as male. Therefore I needed to make some changes, that made more sense to me. Using Elemental Attributions. 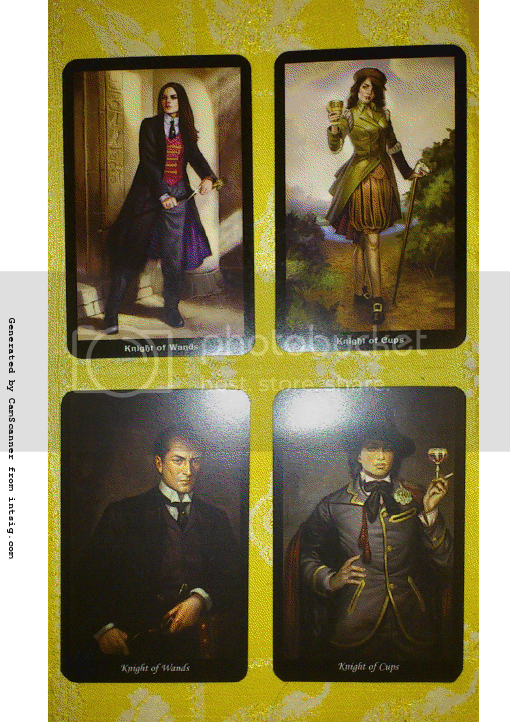 Above you will see the original Steampunk knights of Wands and Cups at the TOP below them are my new Knights. Again; Above you will see the original Steampunk Knights, the Knight of Swords on the bottom left and Knight of Pentacles at the TOP right, and beside them are my new Knights. Knight of Pentacles = AIR mixing with earth, the airy part of earth = Masculine mixed with Feminine (Both), A total Tom Boy and Pirate which I thinks is so perfect for this suit, gold digger. The ship (wood ) is Earth, the sky is AIR, The treasure chest Full of Coins ( Pentacles ) she he is a caption of their own ship and the ship is slow sailing, unless a big gust of wind comes along. and She he even has a cigar hanging out of her mouth, nice little masculine trait. Again the original Steampunk knights that I am not using are put away. Would love to hear your thoughts and comments. 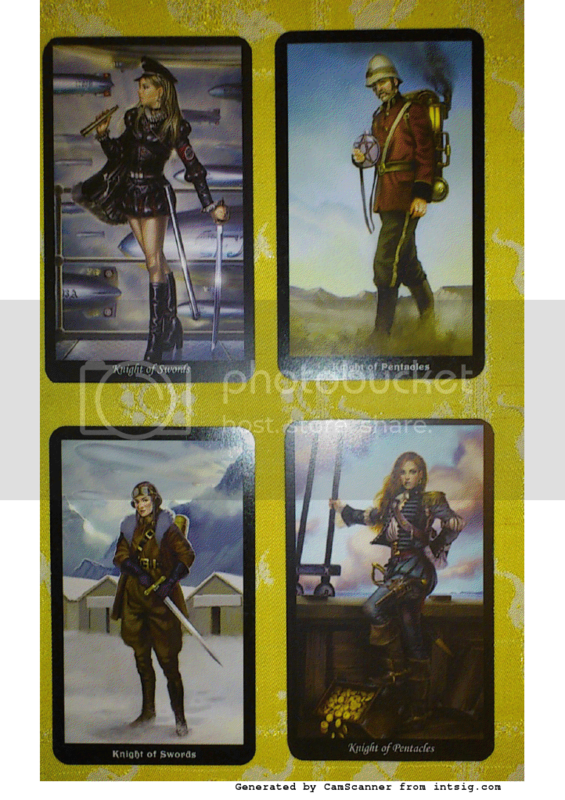 Do you think the new images that I am using with this deck makes better sense than the originals or other. wow, you did well to incorporate these new images. They seem to fit quite well. The image itself does not seem out of place, and the actual size/presentation of the card also looks okay. Do they feel different to the rest of the deck with regards thickness or finish? Well done you. I think if you feel something is not quite right, it is okay to make changes for personal use in the way you have done. Especially if the changes are still in keeping with the deck as a whole. If they work for you - great. I would be interested to see how they come across in a reading. Will you update this thread with thoughts accordingly? Thank you, ohhh they so work for me, and yes they fit so nicely into the deck, I used my scanner and Photoshop to accomplish this little creative idea of mine, I was able to match the black, size, and image placement, etc. then I took these to my friend's that has a print shop he was able to match card stock, and printed them off for me. the only thing I had to do was cut the corners, which didn't go so good. In then end very happy with end result. the feel of the cards are the same, what is really nice. although the new cards are a bit more closer to a matt finish, but not, their laminated, but not as glossy, which is nice, less glare. Soo nice, that I want to print of the whole deck on his nice card stock, however I would need to get written permission to do that. A couple cards your okay to do, cause it is for personal use only, but not a whole deck, copyrights. Which I highly respect. I will be using this deck this week at a metaphysical fair, so I will be happy to share, and after I am going to do some reading exchanges with this deck. I will keep you up to date.